Mother of all boys. Yes, I do believe I hit the jackpot. Cheryl blogs at www.sinceibecameamom.blogspot.com. She and her husband have three wonderful boys ages 8, 7 and 4. She loves blogging, photography and finding joy in everyday life. I have two boys, besides my girls, and I love their compassion and sensitivity. You are blessed! Welcome to the unofficial Mother of 3-Sons-+ club! I agree – with your comment about the quote. It’s almost like people are cursing us – and that’s not how it was over 100 years ago back to Abraham. Mother’s of sons only – God designed us for this, equipped us to be strong enough to do this. What sweet encouragement you found! I am so glad to hear a mom of sons only – who’s older than me – pass us words of encouragement like that! Hooray for boys! I only have 2 but feel the same way! I have 4 boys and have heard all of these and more! Three weeks ago, I gave birth to a baby girl and now the comment that hurts the most is the “Oh, you finally got your girl!”. It bothers me most when said in front of my boys, as if they weren’t good enough so we just kept trying. My boys are amazing and are going to be wonderful husbands and fathers one day. There is nothing sweeter than dandelions from your little boy and their precious hugs and kisses before bed. I am blessed now to have a daughter, but I was ALREADY blessed with 4 amazing boys! I love the words that sweet lady spoke. It’s amazing how an uplifting word can really stick. I actually have three boys too, and one girl who’s the oldest. They all bring me so much joy and love each day. Children definitely help me receive Love. What a beautiful post. My Mom lives in a senior center which happens to be right down the street from where we live so we visit often. The residents there are always making beautiful comments about my 2 and they do seem to have a way with words. Words of wisdom…maybe?! I’m sure the words she spoke to you will remain with you forever! Boys are awesome! I have half a dozen of them! (and some girls, too, lol) Teen boys are easier than teen girls. Thanks for linking! I’ll send this to my boy-mom friends. Ha ha, that is so sweet, Sue! I also had two girls right off the bat and faced similar (opposite) comments, and it made me think, in all honesty, we can say the same thing about having all girls. God has blessed us each with the children He gave us as part of His plan for our lives and I think the big picture Cheryl is trying to paint here is being content and joyful in however that looks. Thanks for visiting M2M and bless your sweet family! I have two boys and I get comments like this all the time! Most recently someone said to me “You have your hands full.” And for once, I actually said something back! Not a mean comeback, but I said “Thank you. I’m very blessed. I’m thankful that my hands are full and not empty”. It was one of those weird moments where I was speaking without actually thinking, but it’s such a true reflection of how I feel! Amen! What a beautiful, graceful and TRUTH-filled reply! I love this! I only have one child, a boy, now, but even now we hear “you’ll get your girl one day” or “that boy needs a sister!” If I have a girl, great, but if I continue to have all boys, that is great too! I will love them no matter if they are male or female! And I HATE that “a daughter is a daughter for life” garbage too…My father in law says that ALL THE TIME and it is so hurtful! What a wonderful comment that lady made to you! I am a firm believer that whatever we are blessed with, as long as we nurture and we love, we have the perfect combination; I have a son and a daughter, both different, but I am confident that if I treat them well, they will treat others, and hopefully me well when I need it as I grow old and grey! Thanks for linking up to the parenting pin it party. Lovely to have you. Tears in my eyes! I have a son and will most likely be blessed with yet another son any day now (almost 40weeks pregnant) and absolutely love this! Visiting from the Wine Down Wednesday Link Party! We have three girls and two boys. The comments to us range from “Wow you have your hands full”, to “Okay, so you need to have another boy to even things out.” I don’t understand why we have to comment so, is it just trying to make conversation? I have decided that it is easier to compliment than to comment. What a sweet lady! I have two boys, and people are always asking me if I wished I had a girl. I love my house of men! i’m a mother of two boys. they keep me busy and sometimes stressed, but they sure are fun. thanks for the great reminder of what a blessing sons can be! My heart soars. Thank you!! I’ve had a saying with my son about caring for each other since he was small. It’s a special bond. Boys are a blessing! As are girls, of course. We’ve got two boys though — wouldn’t trade them for the world. Thank you so much for sharing this on the #SHINEbloghop! I wanted all boys. Eight of them to be exact. Now I have two girls and one son. I can’t have anymore. (I’m sad.) BUT! This post made my heart glad for many reasons. #1 being what you shared about him being mine for only a little while. #2 being, I love the perspective boys have of protecting their mom. So very darling. Thank you for sharing this! Thank you all for your comments on my guest post. In many different ways, your comments all spoke to my heart. I so enjoyed reading them. And Wynter, thank you for letting me guest post. I will continue to enjoy reading your inspirational blog! 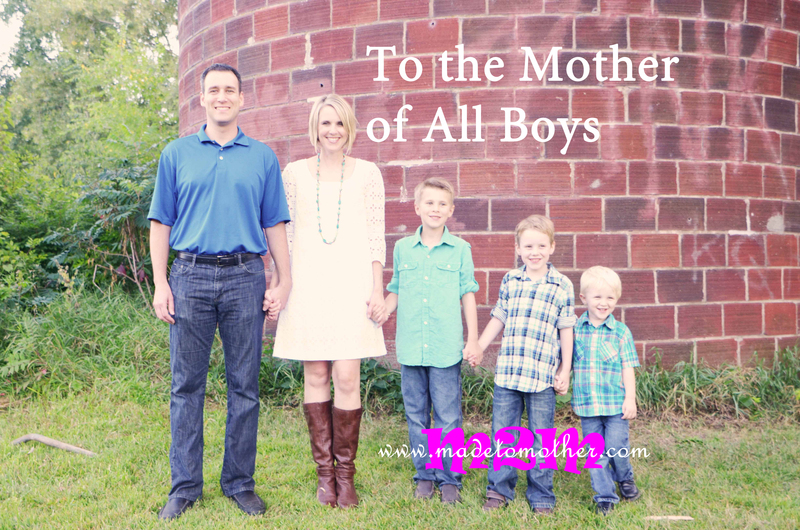 I have heard all these comments and more through my 30 years of parenting…and I have five boys!! This is just a precious piece and it encouraged me as I continue to raise two boys, ages 18 and 8! Enjoy, enjoy…a boys world is precious and special in its own way. “I am their favorite girl and they tell me so each and every day.” – This makes my heart smile! Oh how beautiful!!! What a refreshing comment. Thanks for sharing! I hope this is true but… my husband does not call, write or visit his mother very often. Maybe four times a year all combined. He loves his mom dearly, of course, but out of sight out of mind. My father and his brother were the same way. They flat out neglected the poor woman leaving her to nearly starve to death, living alone in her 90s. Thank goodness her DILs stepped in to care for her. I know both boys loved her dearly when they were little but once grown, they really did forget about her and felt obligation to call or visit more than once a year. So, I think it’s great that it doesn’t always work that way but from my experience, I don’t see boys keeping in contact with mom much after adulthood. It makes me sad to say it because I am the mother of a son, too, but it seems to me there is a reason for the proverb about sons with wives forgetting about mom. Sigh. And one more thing.. in my neighborhood, there are five families around my block where someone elderly is being cared for by a family member. In every case, it is a daughter or DIL who is doing the work. I wonder if there are any real statistics on this. I agree it is frustrating by these comments. I have two wonderful girls and all I get are comments about how people feel sorry for me and good luck. The grass is the same shade of green on the other side:) I think people just want to make a conversation and default to this statement no matter what the gender. Hello and thanks.You have no idea how happy your story made me.Am also a mother of three hyperactive boys and couldn’t be happier.I actually did pray for three boys,why because as a teenager I was difficult and couldn’t imagine handling someone like me.I always regarded my mum as a super woman for her patience and prayers. I love this! I have 4 boys! I adore being the queen of my castle!